When the video of Solange attacking Jay Z in an elevator surfaced on the Internet, there were various reactions to it. Some people were shocked. Some people made jokes. Some people reached out to the Carter-Knowles for a statement. Even now that we may never know exactly what went down in the elevator that led to the violent, one-sided fight, it's raised some interesting questions about the complex angry black woman stereotype and the drama-obsessed nature of our own society. The most bewildering part of the elevator leak, however, was how Beyoncé, Jay Z, and Solange themselves chose to deal with the scandal. In hindsight, their strategy was downright perfect. There's no right way to deal with a private family dispute being made public. There are plenty of wrong ways, but there's no one answer with dealing with the backlash of that kind of scandal. Unfortunately, Olivia Pope doesn't exist in real life and, even if she did, she can't be on speed dial to deal with every issue to hit the celebrity world. She has her hands full enough with politics. However, the way that the Carter-Knowles family enacted their crisis management would have made Olivia Pope proud. They responded to each development in the public opinion of Elevatorgate with an equal but opposite reaction that worked in their eventual favor. There's still time for the story to become even bigger than it was when the news broke, but, until then, the Carter-Knowles are the poster children for handling scandals. Olivia Pope hopefuls should be taking notes. When everyone was freaking out, they ignored it. As soon as the elevator video was leaked, there was a media frenzy. Everyone was talking about it and trying to get Beyoncé, Jay Z, or Solange to talk about it. However, only hours after the video was released, Beyoncé and Jay Z attended a Nets game in high spirits instead. They didn't look worried or anxious about anything other than the outcome of the game. It was an outing so normal that it was like Elevatorgate never even happened and the Internet didn't know how to handle it. People were forced to examine Beyoncé's social media accounts in the lag between the Met Gala and the video leak for clues, because the present Mrs. Carter had nothing new to add. When everyone was making reports, they posted pictures. With no clue from the family about exactly what went down in the elevator, numerous anonymous sources began running to every paper and magazine to give different accounts of what caused the fight. Solange was really drunk. Someone was flirting with Jay Z. This kind of thing happens behind closed doors all the time. When Beyoncé and Solange finally did speak up, they did it by not speaking. Instead, Beyoncé told the world good morning with several Instagram photos of herself and Solange while Solange posted a #TBT photo of herself and Beyoncé on Thursday. Anyone who thought the Nets game was proof that Queen Bey was Team Jay, or that the sisters were at war, was swiftly proven wrong. When everyone was calming down, they made their statement. Just when it seemed like we were going to have to survive on theories and old photos alone, the Carter-Knowles family made a statement about the elevator video: "Jay and Solange each assume their share of responsibility for what has occurred... They both have apologized to each other and we have moved forward as a united family." That statement told everyone the only three things they needed to know. 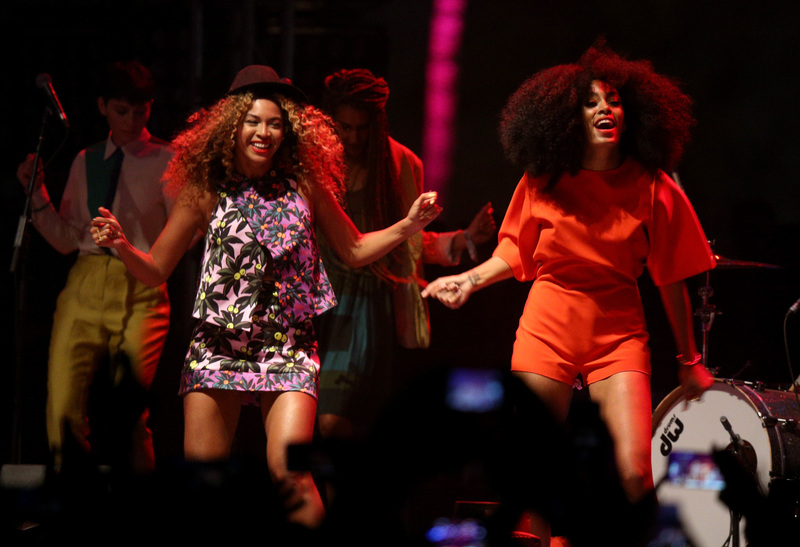 First, despite what we all saw, Solange was not solely to blame for the incident. Second, their disingenuous messages were proof that they moved on long before the rest of the world did. Third, the incident was not, and will always remain, none of our business. What more do we need to know?